"Dogs have always been part of my life, and I just couldn't imagine life without them. When my husband and I just met, and he said he might be allergic to dogs, I seriously reconsidered our future together. Fortunately the tests proved him wrong, and I didn't have to choose between my two loves. 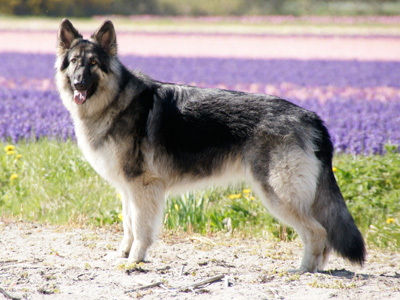 We are a small breeding kennel in the Netherlands, and intend to stay that way, because our dogs are family members first, and breeding comes next. We will do everything within our power to produce healthy puppies with stable temperaments; and we expect the same of our customers during the rest of the dog's life: lots of love, good socialization, ditto food and health care. Before getting into breeding I attended several courses on canine reproduction, genetics, health issues and anatomy. Please don't hesitate to get in touch with us if you are interested in the breed in general, or our puppies specifically. Shilohs are our favorite topic!"